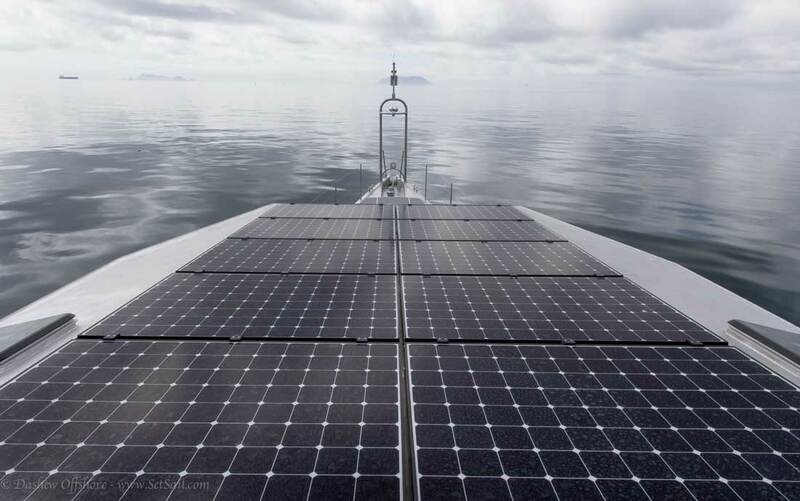 The FPB 97 employs a massive solar array of the most efficient panels you can buy, a unique passive/active ventilation system, and massive traction battery bank, to minimize and in some cases eliminate generator time at anchor. Theory up till now, we are starting to get real world data and the results look promising. 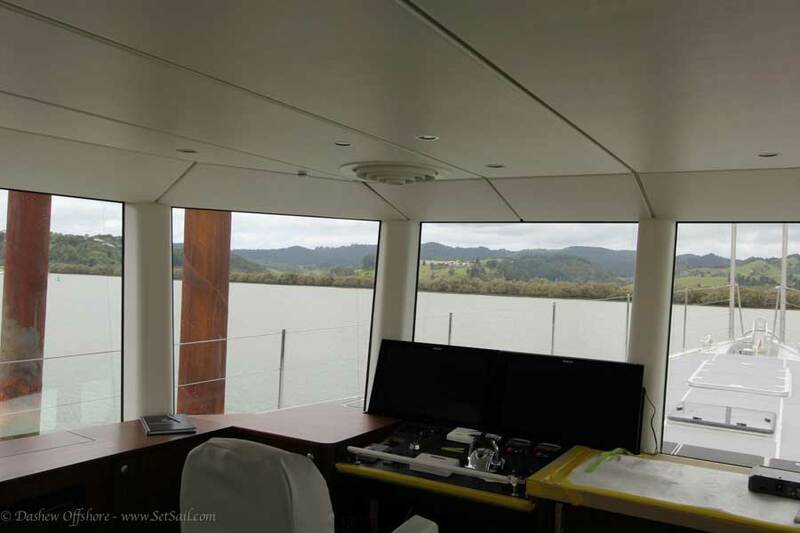 There are twenty of these panels aboard the FPB 97, each capable of producing 320 watts of power. 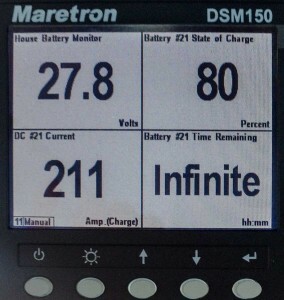 Last week, with the total output of the solar controllers being monitored, 211 amps at 27.8 volts was noted. That is 5865 watts of energy output per hour, after netting out the losses in the charge controllers and connecting wires. Multiply this times five to seven solar hours of output, and the FPB has a lot of solar energy to put to work. 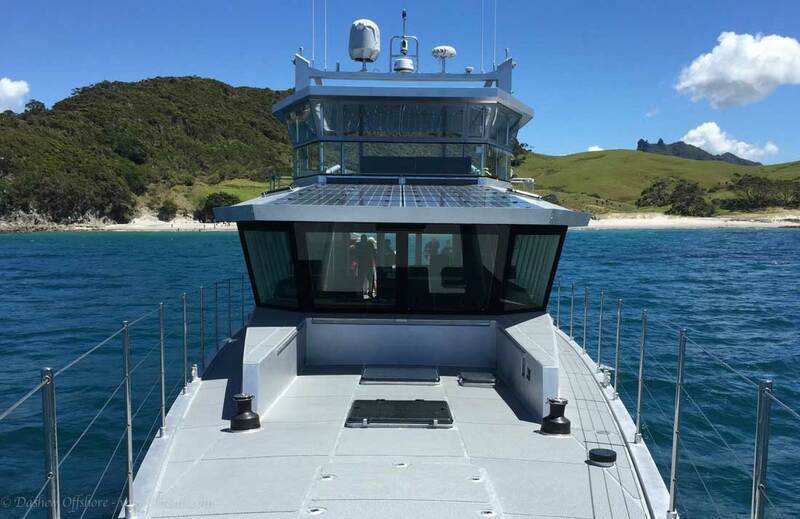 The output was measured at local noon, just after this photo of the sea trial crew was taken, so a nice sunny day with light cumulus cloud cover. The output nets out to 91.6% of rated capacity, or about 5% under after deducting for the line and controller losses. The difference will be due to shading. In our own calculations we have used a factor of 70%, so this result is a pleasant surprise. That handsome looking sea trial crew is composed of, from right to left: Ian Tibbey – chief engineer, Bruce Farrand – general manager, Dennis McCartain – plumbing, Deon Ogden – electrical/electronics, John Richards – project manager, Thomas Stevenson – engineering. If we look at the power required for everything except air conditioning, the water maker, and heating hot water, there is going to be plenty of power available from the sun. And when it is cloudy for a few days, the massive traction battery banks come into play. Heating hot water is not an issue since this is taken care of quickly and efficiently by the diesel boiler. Watermaking chores are dealt with underway, and with several thousand gallons of capacity it isn’t likely the FPB 97 will run out of water at anchor. That leaves air conditioning. You are looking below at what we think is going to be a systems breakthrough–a highly efficient passive ventilation system that will reduce the need for air conditioning, while enhancing the environment on board. 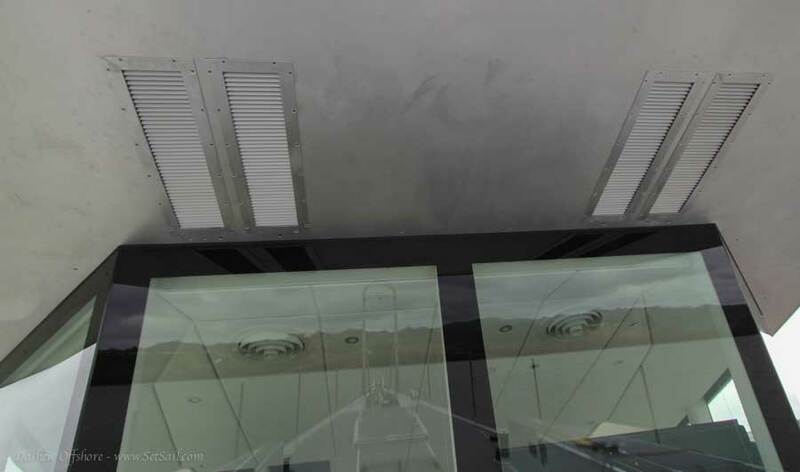 These are two of four large Dorade vents, adjustable and sealable from the interior, which are fed by large water shedding grills installed in exterior “pressure zones”. Four inlet grills are mounted in the great room forward overhang. Each pair feeds a ceiling vent which you can see through the window. One vent is over the great room con, and the other over the settee. Grills mounted in the Matrix deck coaming feed another set of vents in the middle of the great room. Even in light winds these are producing a refreshing interior breeze, reducing the need for air conditioning. So refreshing in fact that the Kiwis have had to throttle them back as there is at present a bit too much air flowing through the great room. This leaves the lower deck, and in particular the sleeping quarters aft. These have their own pairs of Dorade vents, an example of which is above, one blowing in and another extracting. 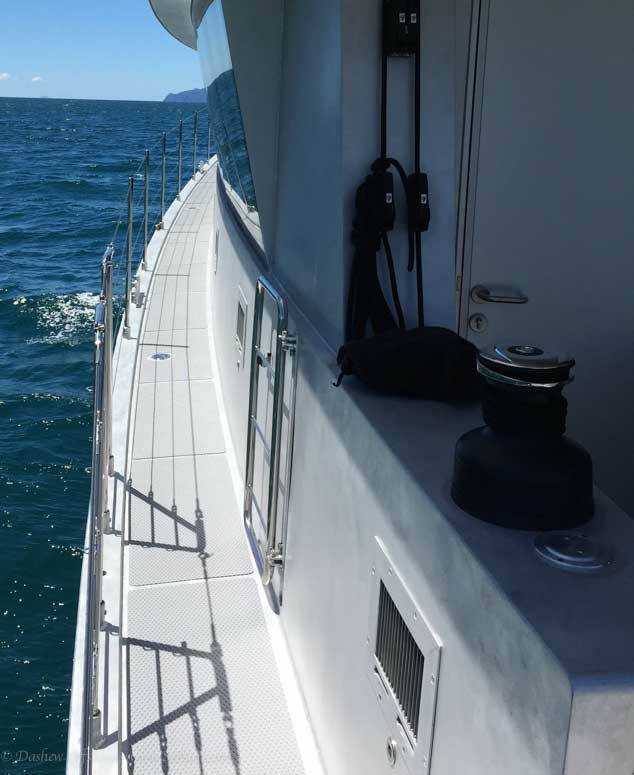 Each vent has a small fan associated with it to insure air flow in the stagnant zone aft at anchor. There will be times when it is hot, the breeze has died, and air conditioning will be desirable. These occasions will be much less frequent than has been the case in the past, and when required, just light off a genset and turn on the air. 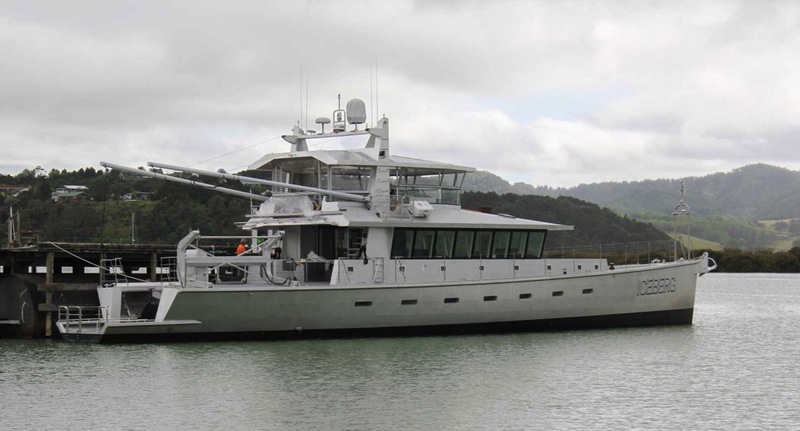 FPB 97-1 sets out today on a four day sea trial. She has an added six tons of fuel aboard (barely a start on her capacity) in her forward fuel tank, and is now sitting parallel to her datum waterline. We are looking forward to reports on how the FPB 97 does when she encounters larger seas than we have seen so far. This entry was posted on Monday, December 8th, 2014 at 7:46 am and is filed under Cruiser's Tech Talk. Both comments and pings are currently closed. The positioning of the vents, grills, and Dorade style interior make the ingress of solid moisture unlikely. I doubt we would consider sealing the vents short of really severe conditions – we are talking weather which personally we have rarely experienced. The lower deck vents in the coaming sides would be the first to be sealed. There are two gensets aboard. Thank you for the answers. For completeness sake: does the air-conditioning get its air through the same vents? Separately, how much exterior noise do the forward and side vents admit? Replacement air is from a vairety of hatches, doors, galley vents, engine room vents, and the various Dorades. We have not noticed any noise yet, but in some wind regimes, if noise is an issue, the vents are easily adjusted or sealed. Great solar array. Hope the panels are well ventilated too, to maximise output. What size and type of traction bank? Have you looked at incorporating vertical panel solar which can change the harvest curve shape from parabola to trapezoid? Early and late sun harvest improvements, particularly in winter. 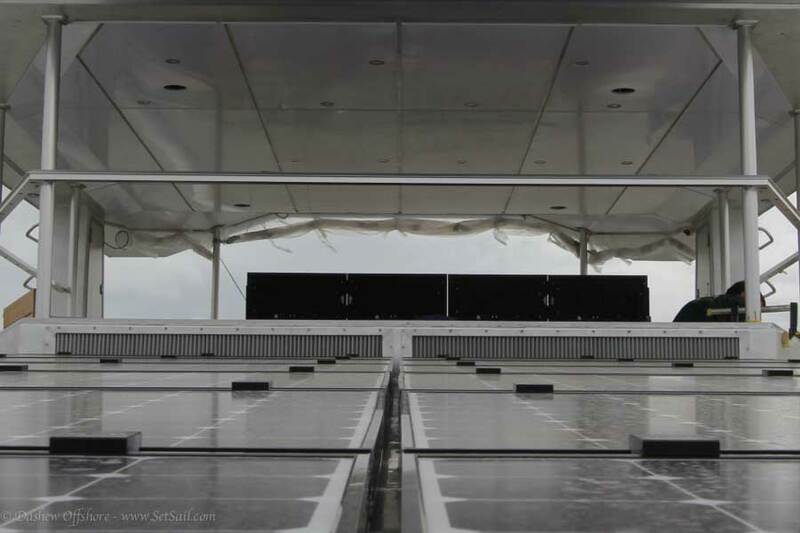 There is space under and around the panels for ventilation, a key factor since panel temperature directly impacts output. Panels are fixed. We think the simplicity and quantity are a good mix for the 97. Have you gone to a fixed boom angle on 97-1? It looks to me like the topping lifts for both booms are fixed. Is this a one off set up per the owners, or being incorporated into future design parameters? Seems to me, a fixed boom puts major limitations on loading/offloading options. Also curious as to the purpose of the “sea gates” that hinge towards the life line boarding openings. Noticed they are secured in the open position in the above pictures. My first thought was they are to keep the grandkids off the bow while underway. Again, just curious. By the way; she’s quite the babe! We have always used fixed topping lifts. Adjustable toppers have to much risk associated with them. The gates are to discourage traffic in areas it is not desired.